I managed to finish the trike today and I am really happy with the way it turned out. I have posted it under the Graphite Drawings tab. I’m not sure yet what I am going to draw and/or paint next. I have a few projects that I would like to attempt…and before you ask there are no motorbikes in the list! This entry was posted in Graphite, Harley-Davidson on June 24, 2012 by Lea Sapsford. I started this trike this morning and I’m really enjoying drawing it. Graphite on A5 cartridge paper. Pencils used so far, 4H, 2B, 3B, 4B & 6B. This entry was posted in Graphite, Harley-Davidson on June 22, 2012 by Lea Sapsford. I know I said I wasn’t going to do another motorbike for a while…..well….I’m currently in the process of starting a drawing of a Harley-Davidson trike! I must be mad!! I was chatting with a friend on-line and we were joking about motorbikes and he mentioned in passing about me doing a Harley-Davidson trike as a joke. However, the more I thought about it the more I liked the idea of attempting one. I’m going to do a tonal drawing in graphite first, then once it’s done, I’m going to consider maybe, doing a painted version. I haven’t progressed very far with it yet but, when it starts to take shape I will post it’s WIP. 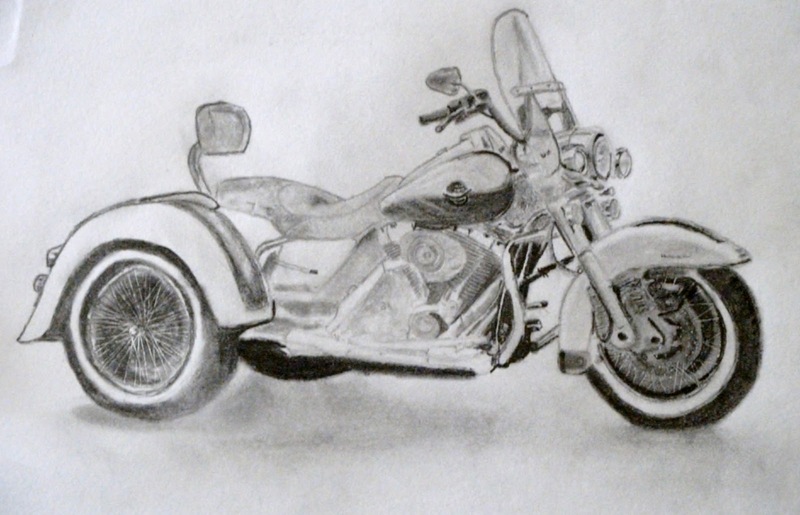 This entry was posted in Graphite, Harley-Davidson on June 15, 2012 by Lea Sapsford.